NYNJ facility will eliminate 375,000 trucks from highways annually. NYNJ facility will reduce carbon dioxide emissions by 18,300 tons annually. NYNJ intermodal yard will have an annual capacity of 250,000 container lifts. GCT USA and the Port Authority of New York and New Jersey broke ground earlier this week for the ExpressRail Port Jersey facility, also known as the Greenville Yard. The facility will be a major ship-to-rail port project located directly adjacent to the recently expanded, GCT Bayonne container terminal. This project will complete the agency’s more than $600 million initiative that establishes direct access to on-dock or near-dock rail service for all of its major marine terminals. Designed to complement the terminal’s big ship handling capabilities and quick transaction time, the intermodal yard will have an annual capacity of 250,000 container lifts, or 430,000 TEUs. 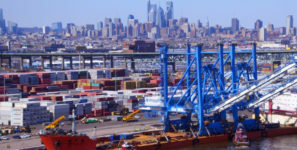 The intermodal facility—scheduled for completion in mid-2018—will connect the Port of New York and New Jersey’s GCT Bayonne terminal to CSX and Norfolk Southern’s extensive rail network, reaching key inland markets. The facility will support the port’s continuously increasing number of rail lifts and higher percentage of east coast market share. In line with GCT Bayonne’s Green Marine certification, the purpose-built ExpressRail Port Jersey facility will feature 9,600 feet of track serviced by high-efficiency, electric cantilevered rail mounted gantry cranes featuring LED lighting. Every container lifted to a rail car displaces the need for 1.5 truck trips. Emission reductions resulting from the switch from truck to rail transport, over the life of the intermodal facility, are expected to total 415 tons of nitrogen oxide and 108 tons of particulate matter. It also will eliminate 375,000 trucks from crowded highways annually and reduce carbon dioxide emissions by 18,300 tons annually. Construction costs for the GCT Bayonne near-dock intermodal facility are supported by a $56 million investment from the Port Authority. The funding will come from monies collected through the Cargo Facility Charge, a per-container fee assessed on cargo shipped through the Port of New York and New Jersey to cover the costs of critical road, rail and security infrastructure projects.